The weekend of September 17-18 the beautiful venue of Dooly's Valleyfield was taken over by the Falcon Cues Quebec Pro Tour. This is the second year of this tour which has stops in Quebec, Ontario and New Brunswick and has been met with open arms by professional players. With handicap tours on the rise combined with the trend of tournaments not allowing Pro's to play this circuit is greatly needed in this area. On this occasion 35 players came to partake, with this stop being so close to Montreal and Ottawa I expected around 60 players for this event. Unfortunately there is just too many tournaments in the area for amateurs to play in, and they did not show up in the numbers I was hoping for. That being said this was still a talent packed field with most of the top players in Québec participating. Favourites going into this tournament were Danny Hewitt, Luc Salvas, Harold Rousseau, Sylvain Grenier, Martin Daigle and of course Alain Martel. Martel who is always a threat and did win last year, seems to have found another gear to start this season. It is my understanding that Martel had some nagging health issues and to a certain extent it showed last season. As a pundit it is most likely an unfair comment however whenever someone is as dominate as Martel has been for decades now even the sightless drop off is noticeable. That being said any concerns are long forgotten as Martel looks better than ever at the moment. 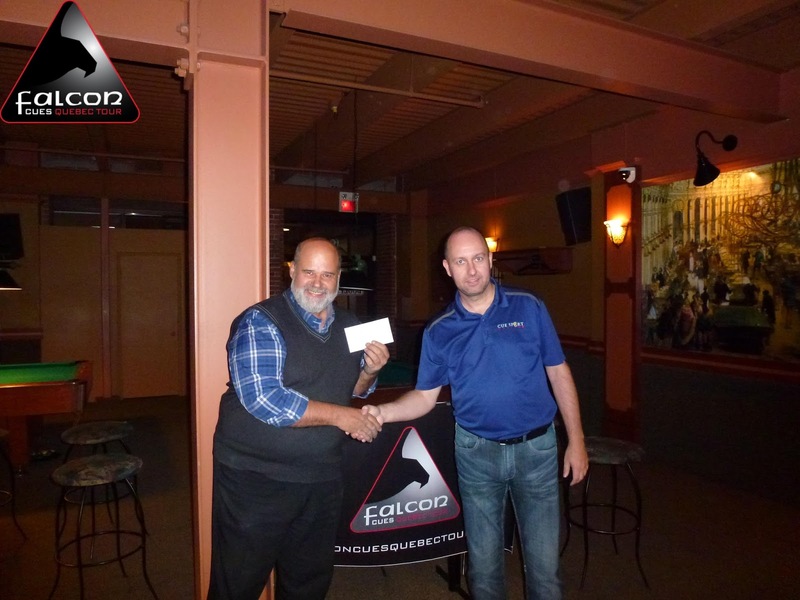 He has started off the season winning the first two stops on the Falcon Tour and it was hard to believe that anyone was going to keep him from winning three in a row. He began his quest for a three-peat against two of the best players from my home room of Rack-M-Up Billiards in Cornwall, Ontario. First up was Jody Roy a solid AAA who Martel dispatched 9-2, next up was local Pro Jared Amyot who after a 3 year absence has come back to the scene. Amyot did what he could but it was a tough task and he fell 9-5. Top player from Mascouche Québec Joey Cicero who lost 11-10 to Martel in the first final of the season was the next challenge. Martel never seemed in trouble against the young upstart and won 9-4. On the other side of the winners bracket a new edition to the Falcon Tour was causing a stir. 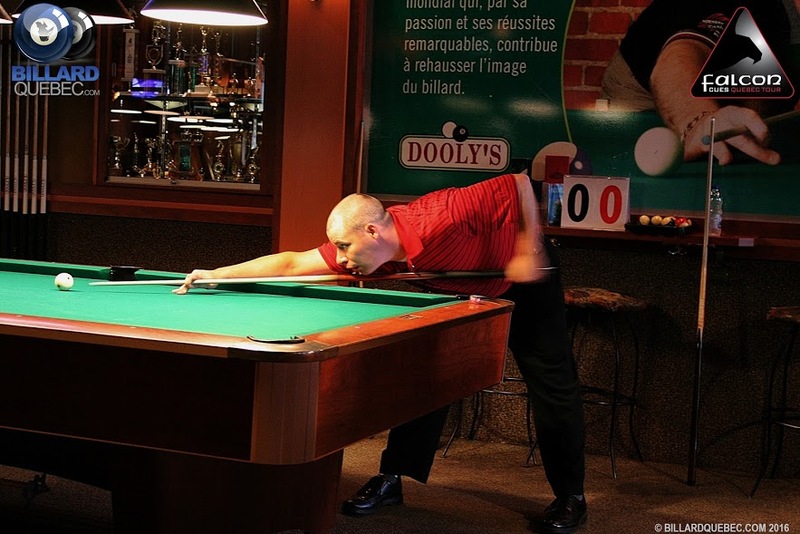 Michael Donnelly from Heuvelton New, York came in as an unknown to the players of Québec, but after beating well known local pro Norm Pomainville 9-4 he got a few peoples attention. Martin Daigle did end his run on the winners side in the next match 9-3. Donnelly was not done just yet however beating a very strong Semi-Pro Sebastien Laramée 9-7 in the last match of the day on the losers side. 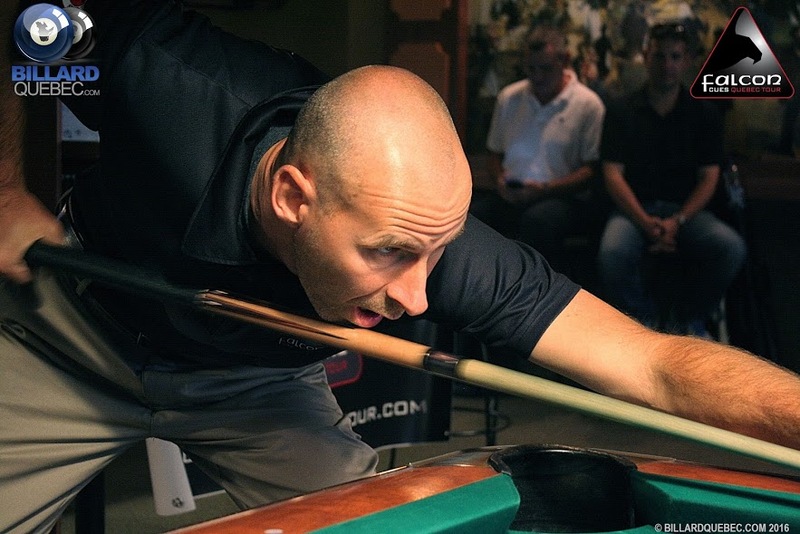 The returning final 8 on Sunday included 4 Canadian legends. Former Canadian Champion Harold Rousseau faced off against Danny Hewitt in the winners side final 4. Alain Martel was in the other final 4 match against Daigle and home town favourite and room owner Luc Salvas was also still alive on the losers side. Donnelly looked poised to make a run at the title defeating Cicero 9-2 in his first match of the day. However in his next match he faced Rousseau who was just defeated by Hewitt. Rousseau played well in this match and took advantage of a couple errors by Donnelly and ended his impressive run in the 5/6 position 9-2. On the other side of the losers bracket Salvas was making a charge knocking Michael Bernier and Daigle out. He then went on to lose to Rousseau 9-7. 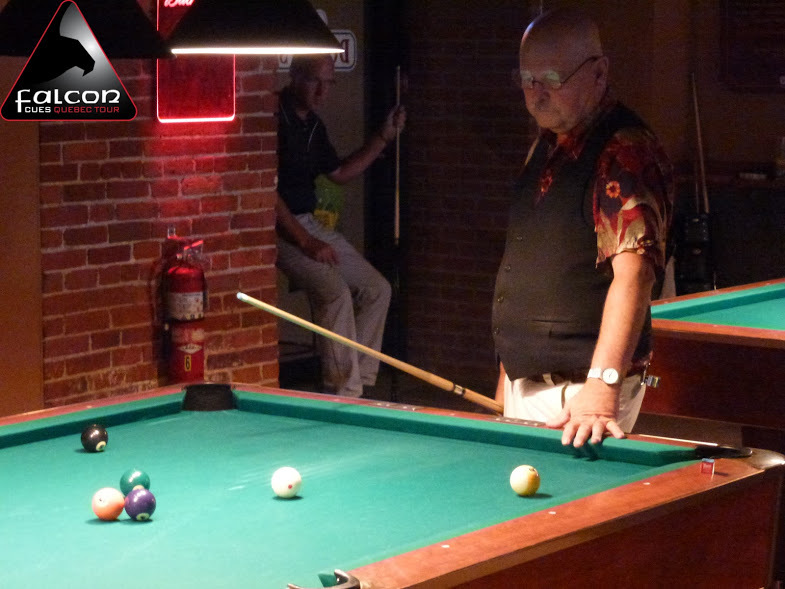 In the winners side final it was an intriguing match up between two of Canada's best Danny Hewitt and Alain Martel. It is always a coin flip between these two and it usually comes down to a few finer points. In this case I noticed that Hewitt seemed to have an edge on the break and ended up winning 9-5. In the losers side final Martel made quick work of Rousseau 9-2 and gave the crowd the rematch they wanted. It should also be mentioned that strong AAA player Armand Fradette also has a three-peat of his own. 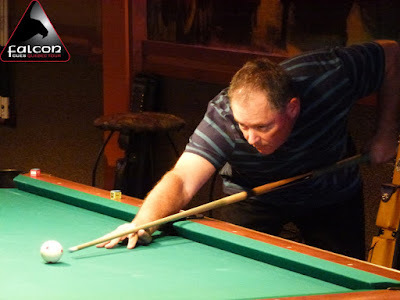 As he has won each of the second chance tournaments this year which is an impressive feat in its own right.